Tell-tale oil drip from sump plug of my 1999 Royal Enfield Bullet motorcycle. I decided to fix the oil leaks on my Royal Enfield motorcycle. The problem is oil leaking from the sump plug on the bottom of the motor and the drain plug at the bottom of the oil tank at the back of the motor. Simply tightening the plugs is not the answer. It doesn't take much tightening to get these in so firmly they are nearly impossible to remove next time you need to open them. Swearing and busted knuckles will be your reward for over tightening the plugs. If you're not careful, you'll easily round off the lands of the plugs, making removing them even more difficult. I eventually had to file the lands down to fit the next smallest sized socket in my workshop. As I so often do, I turned to the experts on the Royal Enfield Yahoo Group for help. You don't necessarily need to pose a fresh question, as many have already been asked and answered. You can search thousands of helpful answers, back to 1999. Just tap "Conversations" and then fill in your question in the "Search Conversations" box and hit "Enter." 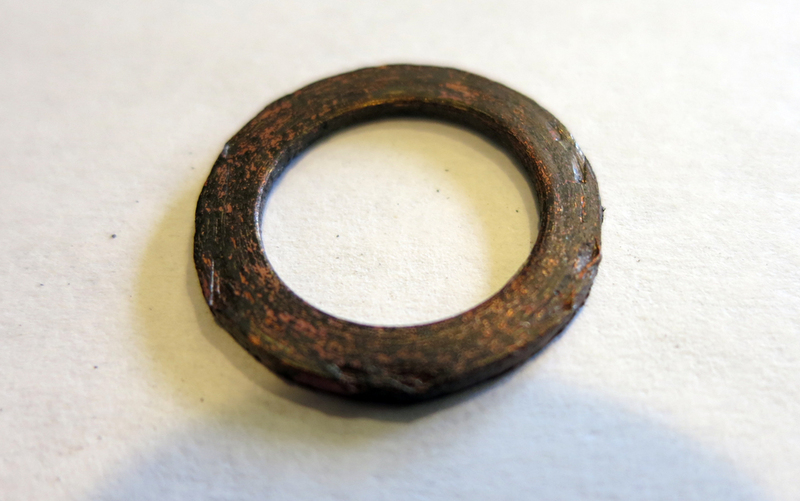 Battered copper washer shows the damage caused by many tightenings. This is how, in 2004, I found a solution that seemed to work — a bar of soap. I kept one in the garage and when it was time to reinstall the plugs I would rub the threads on the soap bar, depositing some soap as I did so. This was suggested for a leaking fuel tap, but for years it did seem to work on the engine oil drain plugs. The theory is that when the leaking petrochemicals encounter the soap it turns into jelly. This is said to be the recipe for napalm (jellied gasoline). The jelly stops the leak. And it worked, or seemed to, for awhile. But, gradually, it wasn't enough. Invariably the Bullet would "mark its territory" on the garage floor. It seemed as though the copper washers that are the plugs' primary defense against leaking were getting battered and thin. They clearly showed the gouges caused by tightening the plugs down on them. Annealing: Washer glows red under flame of blow torch. "Over many years I had collected a box full of various copper washers, some the correct size, but a bit too hard for the bike. A great way to really soften them up is to hang them from a piece of wire, and heat them dark red (with a small propane torch or something like that), and drop them in cold water. This produces a very soft washer which seals very well, and can be used many times over." 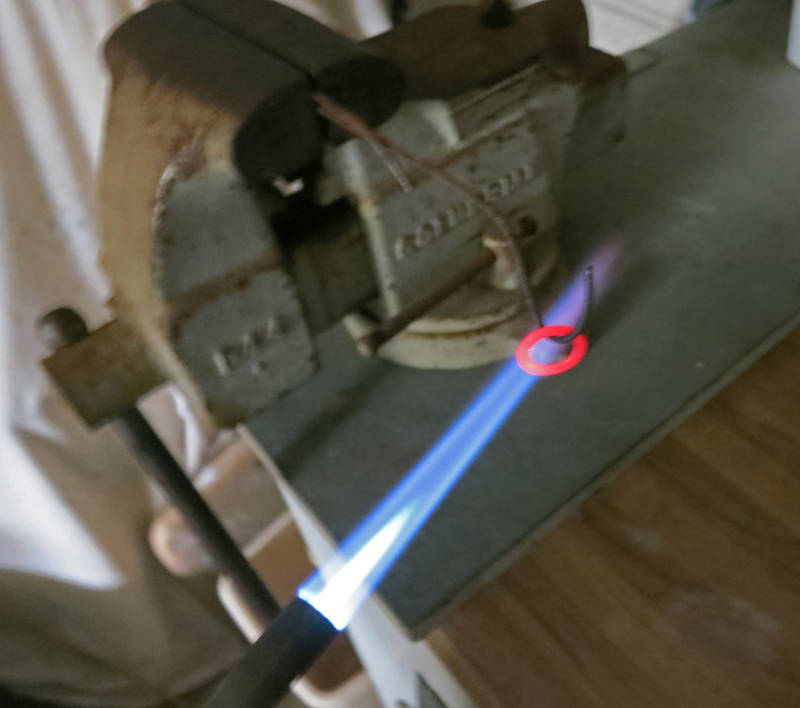 The process is called annealing. Copper, when it's worked (stressed) becomes hard and brittle. Heating to red hot and then cooling (it's OK to let it air cool) returned my washers to respectable, if not perfect appearance. Did they stop the leak? On next inspection the plugs were not leaking oil, although their surface was slick and oily. 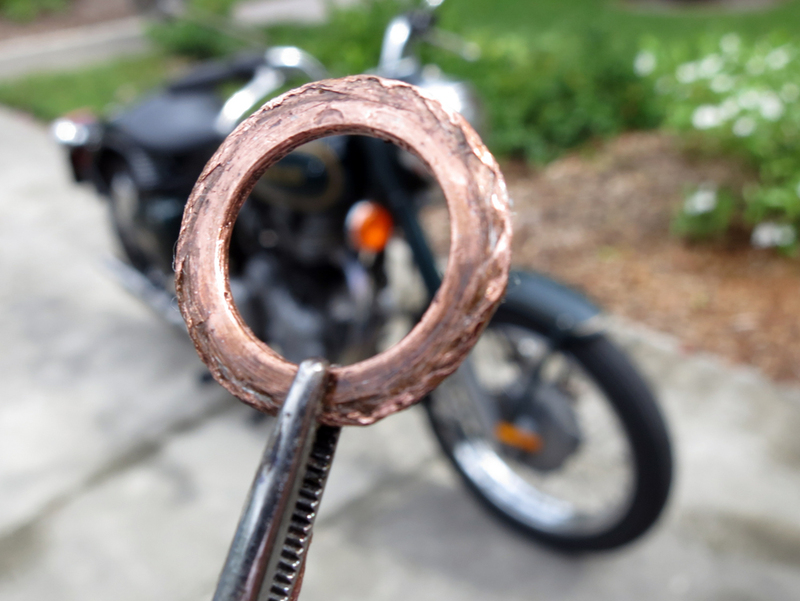 I hope to find a local source of replacement copper washers, figuring that new ones less battered than mine may work still better..
An easier way: Once you've removed the drain bolt, take it over to a local auto parts store such as Advance or Pep Boys. Go to the Dorman Products rack and pick up a package of nylon crush washers that are correct size for the drain bolt. I also brush Permatex anti-sieze lubricant on the base of the head and the threads. When the crush washer gets funky, I just toss it and use a new one. I also use that anti-sieze lube on plug threads before re-installing spark plugs. 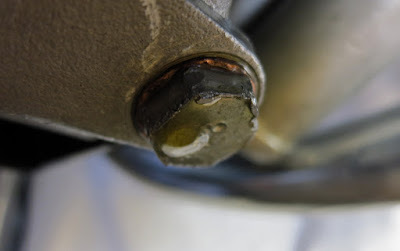 One more thing--that drain bolt in the photo has obviously seen some very ham-fisted wrenching. Get rid of it and buy a new one. Check the threading and length and you may be able to get that at a local auto parts store along with the crush washers.